I just can't express enough how fantastic my pictures are - they are better than I ever thought they could be. Cynthia Larson designs each session from beginning to end around each individual. By promoting the comfort of clients as a top priority, she is able to have everyone look and feel their best, which lets her capture their true personality into a great photograph. During each session, Cynthia listens and learns about her clients and what their vision is of the product. For this reason Cynthia trusts only herself to finalize the photographs. She processes and hand-details all portraits to perfection. Each portraiture is designed for each and every client -- the end result is a beautiful piece of art that is destined to become your legacy. Attention to detail and personal service means higher quality portraits and a product that fully represents each client. The next step of the portrait process is printing. For preservation purposes, the image is professionally processed to protect it from environmental conditions (UV rays, discoloration, humidity, dirt). Larger portraits are custom mounted (stretch canvas, canvas board, and more..). The professional printing process provided by CP Larson Photography protects the image from becoming warped or faded in time. Because of the quality and characteristics of each final portrait, glass is not necessary when framing. The printing process CP Larson Photography uses for all portraits is the highest grade possible on the market. It truly is a beautiful piece of art that will be enjoyed for generations to come. You can feel confident that your beautiful portrait is in good hands and is destined to be a cherished heirloom. CP Larson Photography offers custom framing plus portrait hanging services. With our expertise, we can design the appropriate frame plus hang it for you too. Let us do the work for you - we're here to help! Cynthia, you have a natural "uncanny ability" to tune in to the true spirit of your subject. Your ability to capture the essence of the person is pure magic! You transform the ordinary into extraordinary. Your signature style is one of a kind and to have a portrait done by you, Cynthia Larson, is truly an original. The old saying, “You don’t get a second chance to make a first impression”, is true. When a prospective client walks in your door, the first thing they notice is how the office is decorated. When you meet a client for the first time, or when someone sees your advertisement, what message do potential clients perceive? It’s all about MARKETING. What emotions do you want your clients to feel? How do they perceive you? CP Larson Photography can help you achieve successful marketing through artistic photography. For any business, create a feeling of well being with inspirational, positive, images. If a picture is worth a thousand words, what is your office or business saying? What does your business portrait say about you? A positive visual impression is good for any business. A positive environment builds morale for employees and helps clients feel comfortable and safe. Photographs set the mood; relaxing, stress free, entertaining. Photographs tell the story; a feeling of confidence, you can count on me, you can trust me. In today’s market, photography is a key tool for any successful business; it enhances customer relations and positive feedback, which ultimately creates new business. Great photography is effective advertising. It’s timeless marketing. In a market full of advertising campaigns bombarding potential consumers at every moment, it is important to make your product stand out. Remember, it's that first impression! Cynthia Larson combines her years of in-depth marketing experience and keen photographic eye to make every product unique and memorable. Succeeding in the market place of today requires not only a great product, but a stunning product image as well! 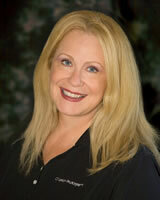 Trust Cynthia to help your company look its best! You took a fabulous picture of my dog. I really appreciate the effort you put into getting "the shot". All gatherings are once in a lifetime occasions. Each with their own emotions, characteristics, and particulars. Cynthia's photographic style captures more than just scenery and people, it captures the feelings of the event. Her images let you invite friends, family, colleagues, and customers to share the moment as though it were happening before them. Cynthia's photography will continue to tell the story of your greatest experiences in the many years to come, without missing a single detail! Cynthia's dedication and attention to detail make the difference for great photography. She takes the time to listen to her client. She will evaluate the logistics of your special event to ensure nothing goes wrong. With her many years as a corporate Global Event Planner and countless Weddings, it will give you peace of mind knowing you have Cynthia on your side. Whether its for personal or corporate events, you truly are in good hands when you work with Cynthia. Call Cynthia now to discuss your special event, as she always says, "I'm here to help." We LOVE our pictures! We can't get over how great they are. CP Larson Photography understands the importance of preserving cherished memories and appreciates your trust and confidence in handling your precious family or treasured heirlooms. We take great pride in providing the best possible quality and service to our clients. To better understand our restoration process, below is a description of services provided in restoring your treasured keepsake. The initial step in photo restoration is to carefully examine each image and discuss in detail what the client hopes to achieve. With our custom digital techniques, not only can we repair and restore your precious picture but it can also be recreated into a new artisic vision. For safety and security purposes, and for the confidentiality of all our clients, all work is done in-house. We will NOT outsource your original image. A new original image will be created with our custom digital techniques; tears, creases, stains, discolorations, missing corners, and more... may be repaired. The hand detailed process is quite time-consuming but necessary in order to restore the integrity of each image. The restored image often looks better than the original; cleaner, sharper, better color, old mistakes are corrected, damage repaired. Cynthia Larson will personally artistically and masterfully take great care and attention to every detail of every image. All work is done by hand. It is critical to preserve the image while retaining the integrity of each image. The next step of the restoration process is printing. For better preservation of your new restored image, the image is then professionally processed and printed with a sealant added to protect it from environmental conditions (UV rays, discoloration, humidity, dirt). For larger images, the new restored image will be custom mounted to aid its preservation. The professional printing process provided by CP Larson Photography protects the image from becoming warped or faded in time. The final restored image often looks better than the original. Because of the quality and characteristics of each final image, glass is not necessary when framing. The printing process CP Larson Photography uses for all images is the highest grade possible on the market to protect each image from deterioration. You can feel confident that great care was given to preserving your cherished heirloom. I was so nervous, you made me feel special, you made me feel and LOOK great! With over 25 years experience, CYNTHIA LARSON of CP Larson Photography is sure to get the shot every time! Cynthia’s Fine Art Photography and custom digital art techniques allow her to specialize in PORTRAITS, COMMERCIAL, EVENTS, and PHOTO RESTORATION. Cynthia has the skill to do the job! Her unique and creative style sets her apart from other photographers. She gets to know each client on an individual level. She creates an imaginative, energetic, and fun environment. Photography is clearly her passion. As she says, "YES, you are photogenic" – she’ll show you how. Cynthia truly believes it is the photographer’s responsibility to help a client feel comfortable, confident, and relaxed in front of the camera. Cynthia brings a friendly and positive attitude to her work, and it shows! She is dedicated to her clients. Because of her renowned artistic and photographic style, she was selected as radio station STAR 101.3’s (largest San Francisco Bay Area radio station with host Don Bleu) OFFICIAL PHOTOGRAPHER and has been featured in the prestigious GENTRY magazine. Cynthia has also been requested to photograph special assignments for Gentry magazine. Cynthia listens to her clients; understanding and fulfilling their vision is what makes CP Larson Photography so unique. Cynthia will even travel the world for her clients, just to get the shot. With Cynthia’s “eyes”, you will be preserving a treasured legacy. Thanks to her commitment to quality, consumer organizations have rated Cynthia’s photography as “exceptional product, moderately priced”; her goal so that everyone can enjoy the experience. To meet the needs of her clients, she also offers a variety of custom photographic products: Handmade and handbound albums from Italy, marble and granite portraitures, fine leather (inside and out) purses custom designed with her photography, fine weaved blankets, custom designed greeting/holiday cards, invitations and much, much more... all personally designed just for you with your own special image. Whether it’s for personal use or for your company’s marketing or commercial needs, you will feel confident you’re hiring the best. From beginning to end, this is what Cynthia and her clients call the “WOW! Experience”. Cynthia's dedication, as well as her creative and outgoing personality, reflects in all aspects of her life. Her oldest son is a graduate of the California Culinary Academy and can be seen on several episodes of Emeril Live! on Food Network. Her second son is a professional film Editor while completing the prestigious Academy of Art University in San Francisco. Her two youngest sons enjoy living life to the fullest. Cynthia also believes in giving back to the community; she is part of a non-profit organization, Moment By Moment, where she donates the gift of photography to families of children with life limiting illnesses. Capturing their love, immortalizing a moment in time, are just a few reasons why she loves what she does. She has also volunteered her services and traveled to Jamaica to photograph the Jamaica Mission Expedition to promote aid and support for a remote orphanage and to Honduras to photograph a Medical Mission trip in the remote mountains of Honduras. In addition to helping the lives of children, she also brings cheer to our senior citizens. For over 10 years, she’s enjoyed being a clown with a special group called Holy Fools who visit local convalescent and retirement facilities. Cynthia’s a California girl, born and raised in the San Francisco Bay Area, and loves everything the State has to offer. She resides in Foster City and is very much a part of the community activities; Judge and Keynote Speaker for Foster City's annual photography contest. Cynthia Larson is a member of Professional Photographers of America, Professional Photographers of the Greater Bay Area, National Association of Photoshop Professionals, Professional Business Women of California, Better Business Bureau (Honor Roll for Outstanding Customer Service every year), and the Foster City Chamber of Commerce. You too can be part of the “WOW! Experience". Call and schedule now to find out what everyone is talking about. As the days quickly slip by, we sometimes forget to plan for those special picture moments. Sign up for our bulletin to receive occasional reminders and unique picture ideas. We are here to help anyway we can. Need to place an order or Re-order? and will only take a minute or two.